Would you drive your car without wearing a seat belt or having insurance? Would you ride your bike without a helmet? Would you leave your 2 year old in the bathtub unattended? Should you manage a project without identifying, analyzing and planning for risks? NO! I have actually been told by sponsors/stakeholders not to identify risks, as if not acknowledging them would make them magically disappear. 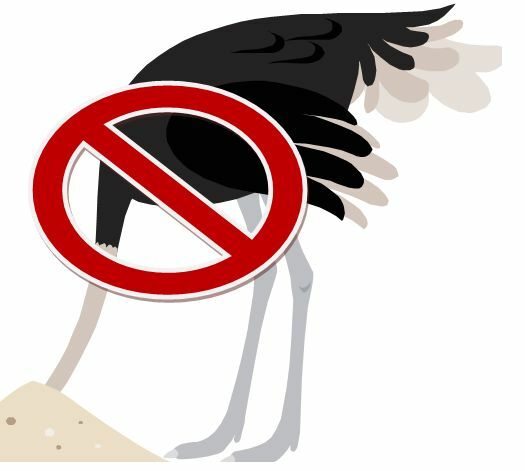 Everyone, pull your head out of the sand now and start dealing with risks. They are inevitable and much easier to handle when you plan for them. Projects and programs generally have many moving parts, which only increases the number of things that can go wrong. I am going to ease you into this gently. We will start by discussing how to identify risks and move through the process. First step – Identify risks. I use PMBOK’s* 5 process areas and 9 knowledge areas as a guidelines for this task. All stakeholders should be involved in identifying risks. Expect resistance from all involved. Identifying risks means admitting vulnerabilities and that is very scary for most people. Events or occurrences by themselves are not risks. The risks are in the consequences or outcomes of those events or occurrences. For example, we may experience snowstorms is not a risk. We may experience snowstorms, which could lead to power outages and lack of critical services. A good risk statement identifies the risk event and the consequences. Think of it as a IF>THEN statement. If a happens then it could lead to b, c, and d occurring.